The Road to the Horizon: Summer is over. Snif. We hardly had a single drop of rain in July and August. Two weeks ago, it was that hot, I had to buy a fan. A week ago, almost at the flip of a switch, the weather turned around. Thunder, lightning, rain... I had to close the windows at night. 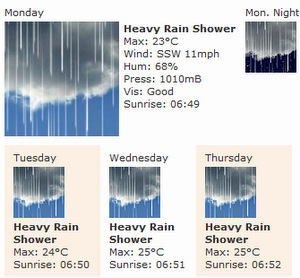 And according to the weather forecast, it looks like the summer is over. In the next 10 days, we will have one day of sunshine.